Ben Robinson/GoBuccs.com Covington’s Jesse Fisher sacks Minster quarterback Jacob Niemeyer. Ben Robinson/GoBuccs.com Covington’s Brayden Wiggins runs for a touchdown. Ben Robinson/GoBuccs.com Covington’s Parker Dysinger hauls in a touchdown pass. MINSTER — There’s a reason the Covington Buccaneers amped up their non-conference schedule with the addition of St. Henry in week one over the past five years and now Minster for the second straight year in week two. That reason is Covington has aspirations of taking the program to the next level – where it’s not just good enough to qualify for the state playoffs, but to have post-season success once it gets there. But when you raise the level of competition with a young football team, you understand the likelihood of taking your lumps and bumps along the way. 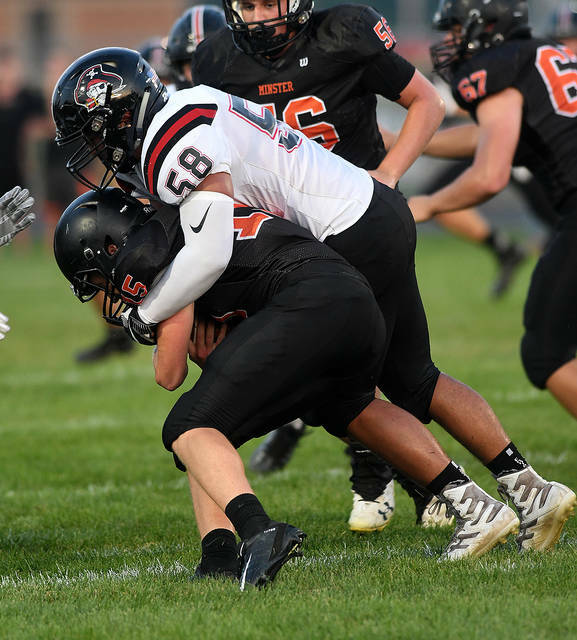 St. Henry gave Covington some lumps and bumps, along with plenty of data for improvement last week – and Minster, who is the defending state champions in Division VII, did the same on Friday as it handed the Buccaneers a 39-26 defeat. And what Minster showed Covington is a great team doesn’t shoot itself in the foot with mistakes as the Wildcats played turnover-free football, while the Buccaneers had four turnovers – all on interceptions. “Can’t turn over the ball and expect to win against a good football team like Minster,” said Covington coach Tyler Cates. What Minster also showed the Buccaneers is great teams take advantage of opportunities that are presented. In all, the Wildcats scored on three of the four Buccaneer turnovers, while Covington had several chances to reach the end zone and failed to capitalize due to an untimely penalty or a turnover. 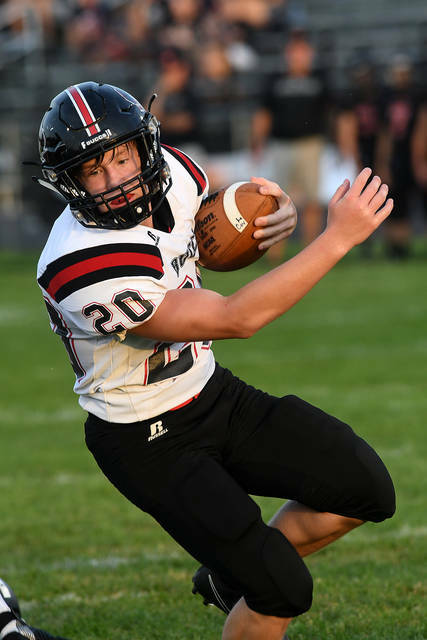 But what Covington can hang its hat on as it prepares for the league opener next week at Fort Loramie is the fact that it has numerous offensive weapons at its disposal, a defense that swarms to the football, and an entire roster of players who give maximum effort. Consider, Covington had ten players touch the ball for positive yardage on Friday. It had a defense that made some critical stops in clutch situations – one on a goal line stand to end the first half. The Buccaneers also had players make big plays for two scores in the fourth quarter after being down 39-12. “We faught until the very end and we can build on that,” Cates said. Playing in a hostile environment, things couldn’t have started any better for Covington as it forced Minster to punt on the opening possession of the game and then drove the ball 65 yards for the first score on a five-yard run by Brayden Wiggins for a 6-0 lead as the point-after attempt failed. But Minster was able to respond thanks to a big pass play from quarterback Jacob Niemeyer to Austin Brown that moved the ball inside the Buccaneer five. A few plays later Alex Schmitmeyer powered in from a yard out and the point-after kick went through to give the Wildcats a 7-6 lead as the first quarter came to a close. “We had way too many breakdowns in the defensive secondary and that really hurt us pretty bad,” Cates explained. The defensive breakdowns in the secondary continued into the second quarter as Niemeyer connected with August Boehnlein from 21 yards out with 11:30 left in the half to push the Wildcats lead to 13-6 as the extra point attempt went wide right. The Wildcats then used the big play once again as Niemeyer hooked up with Mike Ketner on third down with 24 yards to go for 48 yards inside the Buccaneer ten. Two plays later Schmitmeyer ran for 6 yards and a score to increase the margin to 20-6. Covington had a golden opportunity to chip into the lead on its next possession, but turned the ball over via interception in Wildcats territory. After a run and short pass resulted into a first down at the Buccaneer 49, Niemeyer connected with Trent Roetgerman on a scoring strike behind the Buccaneer defense to push the margin to 27-6 with 7:16 left in the half. Needing some momentum to keep the game from getting out of hand, the Buccaneers showed their competitive drive by executing their most impressive drive of the contest – driving 68 yards for the score on a one-yard plunge by quarterback Cade Schmelzer. The two-point conversion attempt failed, leaving the score 27-12 in favor of the Wildcats. With 2:20 left in the half, Minster went on a march of its own in an attempt to increase its advantage before the break, but junior linebacker Brayden Wiggins made a huge stop on Schmitmeyer inside the Buccaneer five to end the threat. Covington, who came out of the locker room riding high from the defensive stop, went to work on the opening drive of the second half by methodically moving the ball inside the Wildcat 20. Unfortunately, the Buccaneers committed the one mistake it couldn’t afford as a Schmelzer pass was picked off by Minster’s Mike Ketner – the second of his three picks – at the five. After both teams traded punts, Minster once again used the big play to put itself into scoring position in the waining moments of the third quarter. Schmitmeyer finished off the drive with a five-yard run to move the Minster advantage to 33-13 with 28 seconds left in the third. Schmitmeyer would then score his fourth touchdown of the contest midway through the fourth quarter on another five-yard plunge to virtually put the game away, 39-12. But there is some fight in the dog when it comes to this young Covington squad, which was proved by back-to-back scoring drives in the final five minutes. 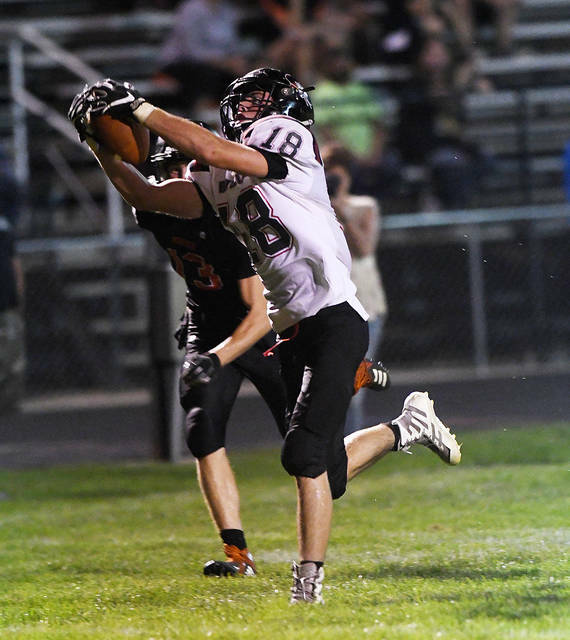 First, senior Parker Dysinger hauled in a 30-yard pass from Cade Schmelzer and then junior Kleyton Maschino followed with a 48-yard touchdown catch to make the final score 39-26 in favor of Minster. Despite falling to 0-2 on the young season, Covington feels out is still a good football team. Which gives Covington data on areas in which it needs to improve if it hopes to challenge the better teams in the state of Ohio – which is the ultimate goal. Which is doing what it takes to be a great football team – like the two teams Covington played to start the season. https://www.dailycall.com/wp-content/uploads/sites/30/2018/09/web1_jesse-fisher.jpgBen Robinson/GoBuccs.com Covington’s Jesse Fisher sacks Minster quarterback Jacob Niemeyer. https://www.dailycall.com/wp-content/uploads/sites/30/2018/09/web1_brayden-wiggins.jpgBen Robinson/GoBuccs.com Covington’s Brayden Wiggins runs for a touchdown. https://www.dailycall.com/wp-content/uploads/sites/30/2018/09/web1_parker-dysinger.jpgBen Robinson/GoBuccs.com Covington’s Parker Dysinger hauls in a touchdown pass.